As a premier distributor for office equipment and supplies, OES-Solutions has the experience and widespread partnerships to impact your business on a daily basis. They stock an array of OEM printers, multifunction copiers and consumables from several of the industry’s top manufacturers. With over 20 years of experience and $300 million is sales, OES-Solutions offers products, programs and support that will cater to the needs of independent office equipment dealers throughout the United States. Founded in 2000 by Chip and Danny Terril, the concept of OES-Solutions became a reality based on the highest standards of integrity, reliability, and flexibility. Mike Oehler, also experienced in the industry, joined ownership within the first year of operations. The team then began to do business with the diversity that would give them an edge over the industry norm. In 2004, OES-Solutions partnered with Sharp Electronics as a Master Distributor. 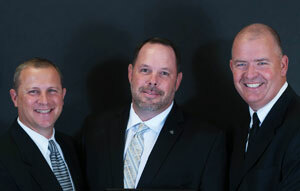 OES-Solutions has been presented with Sharp’s Diamond Distributor award every year since. In 2007, OES-Solutions and Sharp partnered again to release Sharp’s Certified Channel Reseller (CCR) Program. This unique program allows dealers to work with OES-Solutions and gives them access to Sharp’s award winning product line. Today, OES-Solutions remains independently owned. They operate a 15,000 square-foot, state-of-the-art distribution center in a centralized, Midwest location. OES-Solutions distributes office equipment and supplies to independent dealers in all 50 states. They also maintain a robust workforce with an average tenure of 14 years of industry experience. The OES-Solutions vision is to create a solution for every independent dealer in the United States. Whether it is their state-of-the-art technology, or one or their diverse programs, OES-Solutions continues to be at the forefront of industry growth.